Two itinerants. Incredibly simple things. Interesting angles – random clicks. A very short but joyful 4X4 drive on sand took us to a not very impressive narrow crack in a stone… but that crack led us into a completely different world, a world like no other. A narrow-passage-canyon with mystical texture, color and beams of sunlight streaming… it was almost impossible not to wonder ! …hard to believe that erosion is the cause of everything that was in sight – changing every moment yet almost same for thousands of years – ‘poetry in stones’ is the word to describe the place. It is a geological marvel with fascinating rock formations. Equally fascinating is to learn how slot canyons are formed and how they change with each rain, flood and even with whistling wind lost within those walls. 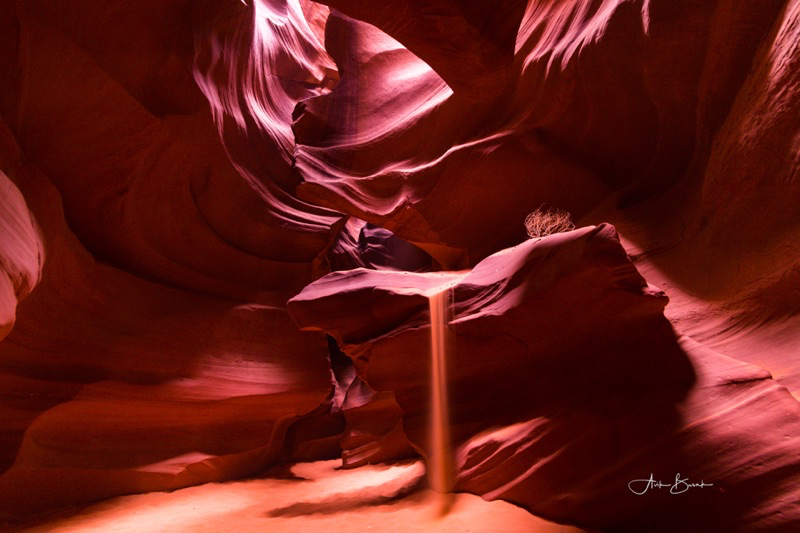 It is an amazing experience to encounter, wonder (– only nature can create such perfect piece of art -) and imagine sand mixed water whirling and sculpting the walls of canyon, reshaping a mystically glowing wall with different shapes and patterns. Nature’s perpetual work continues – Protean shapes with ever flowing time. If you are a little inquisitive, guides are happy to walk you through the history of the canyon and educate you with the history of Navajo people. The place was crowded and dusty too, everywhere we looked there were people, a photo getting clicked, a story being explained by tour guides (you cannot go on your own, only way is to take a tour). Perhaps it is only place in the world where guides suggest you camera settings and locations based on daylight. It is a place of incredible beauty but not a place of solitude. But none of these make it any less stunning, it is one of the greatest natural wonders one can ever experience. It is so awe-inspiring that it triggers emotions. It makes you wonder that something could be so beautiful. You turn your eyes and all you see is spectacular contours beholding awe and beauty. A handful of fine sand into the air, light hits the dust and creates a surreal haze – cascading into images of creative alternatives. Expectations bend realities… when we find something beautiful it is not just a function of the absolute beautifulness of that thing but also of our expectations; and bar of our expectation was set extremely high after wandering in beautiful canyons, deserts and colorful mountains of Colorado plateau. It was the last stop of our long commune-with-nature trip. We had already been to Bryce, Zion, Arches, Monument valley, Grand Canyon, Horseshoe bend and a dozen of other notable stops. We were somewhat exhausted too but it proved more beautiful than everything we had imagined! Thank you and Happy New Year ! 31 Dec	This entry was published on December 31, 2016 at 12:05 PM. 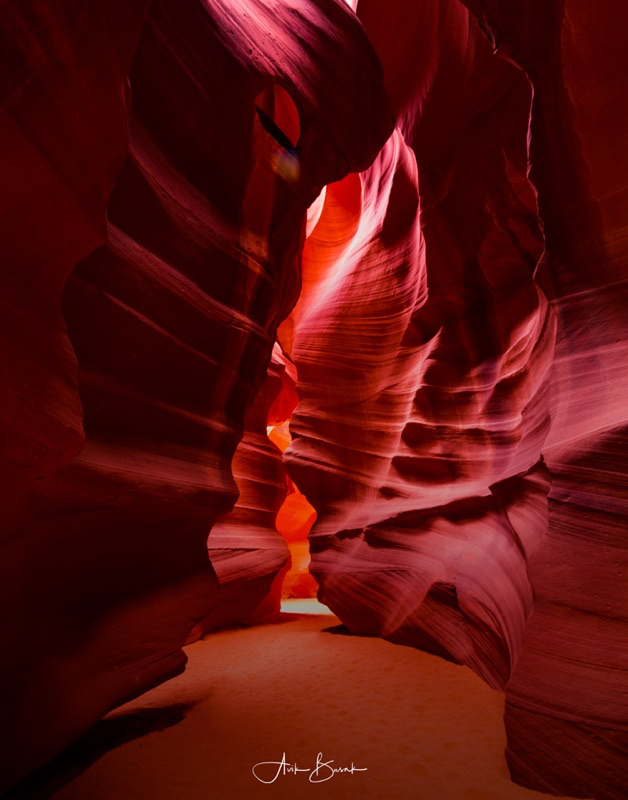 It’s filed under National Parks, Photography, Travel, US National Park and tagged American Southwest, Antelope Canyon, arizona, awe, awe inspiring, Beauty, colorado, Grand Circle, Lake Powell, Nature, Navajo, page, Photography, sand, surreal, Travel. Bookmark the permalink. Follow any comments here with the RSS feed for this post.